They say "Trade shows are dead!" If you try to run them the same old way, you'll see diminishing returns. Sure, everyone will say you still have to attend the show "so that the industry doesn't wonder about the health of your company" - but what a crappy justification. 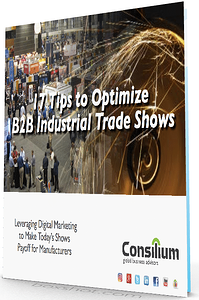 Instead, this guide will help you adapt your industrial trade shows to buyer expectations, behaviors and evolving technology in the internet age. Download the guide today for a quick read and comprehensive overview of how you can apply this powerful methodology to your upcoming shows so that last year's disappointing results don't repeat. Whether you've almost given up on shows, or remain committed, this guide lays out what's possible. And the possibilities are really exciting. Written by someone who's "been there and done that" this eBook provides the "real world" insight that's often the difference between average and extraordinary return on industrial trade shows.